When it comes to our foreign policy, India does not rely on a zero-sum game strategy. We trade arms with the Russians and sign defense agreements with the Americans. In 2016 we were officially recognized as a Major Defense Partner of the United States; less than a year later, we negotiated a $10 billion weapons deal with Russia. We also buy oil from both Iran and Saudi Arabia. In fact, Saudi Arabia is our second largest supplier of crude oil and Iran our third — behind Iraq, who in 2017 surprisingly jumped to first place. We work with ideological rivals, geopolitical counterweights and even with those we've had historical enmity with. We forge new partnerships where opportunities arise and mend old disputes to gain common ground so we can move forward in a mutually beneficial relationship. From our perspective, foreign relations is not an all-or-nothing business. We are willing to work with anyone who is willing to work with us. So when a few of our left-leaning politicians say that Israeli Prime Minister Benjamin Netanyahu is not welcome in the country and that they, along with some religious groups, will protest his visit, I cannot help but think that they're completely oblivious to the last 70 years of India's foreign relations history. The very fact that Netanyahu is arriving less than a month after India's U.N. vote against President Trump's recognition of Jerusalem should tell us that even the deepest of feuds need not determine a nation's foreign engagement. The history of Indo-Israeli relations is a lesson in itself of how foreign diplomacy can work even when you don't see eye to eye on every issue. On Nov. 29, 1947, India was one of 13 countries to vote against the U.N. plan to partition Palestine, which would create the State of Israel. Two years later, India, again, voted against Israel, this time on their inclusion in the U.N. Yet, barely a year later, India recognized Israel's statehood. Four decades of informal, at times friendly, at times icy, relations would go by, but in 1992 India would formally establish bilateral ties with Israel, opening its mission in Tel Aviv. Since then, trade between the Middle Eastern and the South Asian nations has skyrocketed from $200 million to more than $4 billion, plus billions-of-dollars-worth military contracts. Last July, Narendra Modi became the first Indian prime minister to visit Israel, healing old wounds and ushering a new phase in the history of Indo-Israeli relations. Throughout this entire time, India and Israel have still remained at odds on many issues. India has voted several times against Israel in the U.N., maintained economic ties Israel's nemesis Iran and remained on the Palestinian side of the Israeli-Palestinian conflict. Nevertheless, what India and Israel might disagree on has not prevented them to pursue what they do agree on. Israel — a pioneer in agricultural solutions for harsh environments — has been an indispensable partner to Indian agronomists who are looking for soil-water management solutions to challenging, and often erratic, rainfall patterns. This comes at a time too when India is facing one of its worst agrarian crises, with tens of thousands of farmers committing suicide after losing their livelihood to a combination of droughts and economic setbacks. India and Israel also face the common scourge of terrorism driven by extremist religious ideologies. As extremists gain adherents within borders and become more sophisticated in their tactics, intelligence sharing and cooperation in counterterrorism operations is paramount for both nations. Moreover, India, who's in track to have the largest Muslim population in the world and who is a burgeoning pluralistic democracy, can show the way forward for cooperation between cultures and faiths. Though some might accuse Prime Minister Modi of performing a dangerous balancing act by befriending Netanyahu while maintaining ties with Palestinian Authority President Mahmoud Abbas, no one can deny India is one of the few nations in the world which has truly cordial relationships with Israel, the Palestinians and the Arab states. India could very well play a critical role in peacemaking in the Middle East region. When world leaders place litmus tests on bilateral relations they limit their own influence and in turn the potential of their people. Both India and Israel have much to contribute to each other, even when they might sit on opposite ends of the modern world's most divisive issues. India should welcome Prime Minister Netanyahu with open arms. Most Rev. 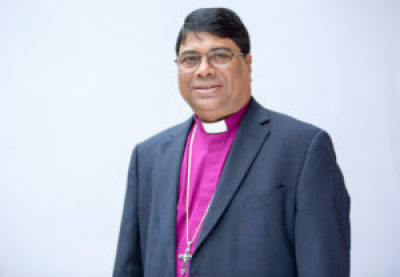 Joseph D'Souza is the Moderating Bishop of the Good Shepherd Church and Associated Ministries of India. He also serves as the president of the All India Christian Council. He is the recipient of numerous awards and accolades for his work as a human rights activist. He is also the founder and international president of the Dalit Freedom Network. Why Would a Bible Translation Use the Word 'Palestine'?